Scorpion venom seems like a strange place to look for new cancer drugs. How could a lethal concoction of hundreds of toxins contain anything beneficial? Yet a new drug to aid tumor removal — now in early-stage safety testing — comes from the venom of one of the world’s deadliest scorpions, the deathstalker scorpion. Called Tumor Paint, the drug can be used by surgeons in the middle of an operation to determine which parts of a brain tumor are cancerous — by making those areas glow under infrared light. Its key ingredient mimics a poisonous compound the deathstalker scorpion uses to paralyze its prey in the deserts of the Middle East. “These are the drugs plants and animals use every day to defend themselves,” says Dr. Jim Olson, pediatric cancer surgeon at the Fred Hutchinson Cancer Research Center in Seattle, who developed an early version of Tumor Paint in 2007 and is now working to commercialize it. As a basis, Olson and his team used a chemical in deathstalker venom called chlorotoxin, which targets nerve cells. With some tweaks, a similar chemical in Tumor Paint is able to specifically target cancerous cells in the nervous system, including the brain. But these changes don’t stop Tumor Paint’s ability to glow like the deathstalker. Many scorpions glow, but it’s a curious phenomenon that scientists still don’t understand. One hypothesis is that scorpions use their own glow as a signal for when the moon is overly bright, enough that they could be spotted by their prey. If the scorpions don’t glow, they know that it’s safe enough to hunt under the cover of night. 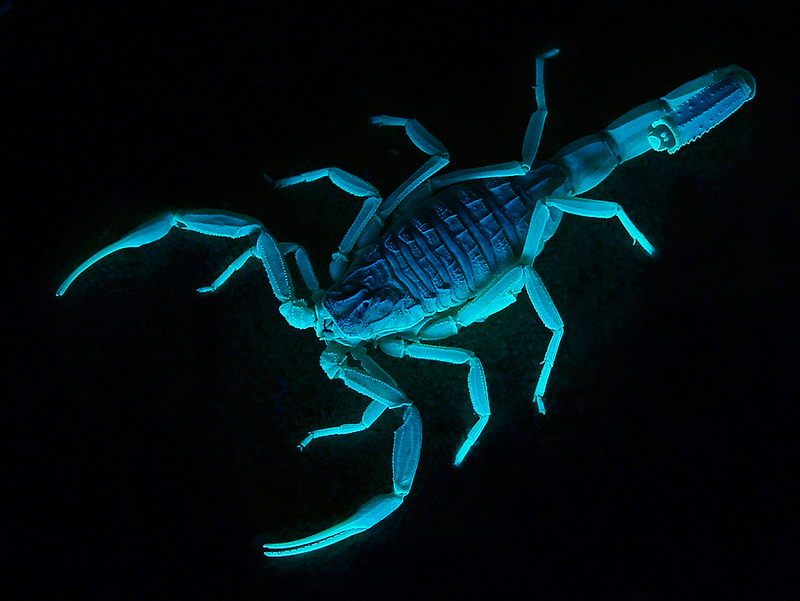 Unlike the deathstalker scorpion’s moonlit glow, Tumor Paint isn’t actually visible to the naked eye but instead requires the use of a camera in the near-infrared range. By looking at a monitor, a surgeon can see what areas are glowing and focus their efforts there, since Tumor Paint only binds to cancerous cells. Olson says Tumor Paint’s pickiness is a quirk of cancer biology. When a cell becomes cancerous, proteins normally found inside the cell get flipped onto the surface. Tumor Paint is able to bind to one of those proteins, although it’s still unclear exactly which one it is. Olson and his team have a hunch that it may be a protein called annexin A2. It’s suspected because chlorotoxin’s preferred method of attack is via calcium channels, which play a role in neurotransmission in the brain. Annexin A2 is responsible for regulating how much calcium passes through these channels. Tumor Paint is currently in the first phase of clinical trials, which began in the United States and Australia in December 2013. These trials are primarily about safety, says Dennis Miller, who oversees drug development at Blaze Bioscience, a Seattle-based company Olson co-founded to manufacture the drug, known as BLZ-100. In this early stage, consenting patients are given the drug and observed to ensure there are no side effects. Testing has not thrown up any major concerns to date, says Olson, although formal results have yet to be published. If BLZ-100 proves safe, the trials’ focus could shift to its effectiveness as a surgical aid. Other experts in the field say Tumor Paint looks promising — but so do other drugs that can illuminate tumors. “There are a host of technologies being thrown at this problem today,” says Dr. David Roberts, chief of neurosurgery at Dartmouth-Hitchcock Medical Center in New Hampshire. Roberts is researching another chemical, 5-ALA, with similar glowing and binding properties. While developments in tumor-imaging systems greatly helped surgeons, he says, a chemical that can bind only to cancerous cells and illuminate them would be a Holy Grail. It reminds me of an old medical method in China-treating toxin with toxin. That’s an interesting research aspect. Besides the drug get from Scorpion venom plays a role like what fluorescent labeling works in marking proteins. Hope it will past the safety test.